There are some economic data which will affect USDJPY for today such as the Tertiary Industry Activity m/m and 30-y Bond Auction, PPI y/y in Japan and the 10-y Bond Auction, Wholesale Inventories m/m, JOLTS Job Openings, and NFIB Small Business Index in the US. USDJPY has been moving with bullish bias for a while and it is getting close to the 61.8 of Fibonacci retracement. The support rests at 102.350 with resistance at 103.730 which both lines are above the weekly pivot point at 101.11. The EMA of 10 is growing sharply and it is getting near the EMA of 100. The RSI is moving in overbought area, the MACD is in positive territory and the ADX is showing strong buyers. 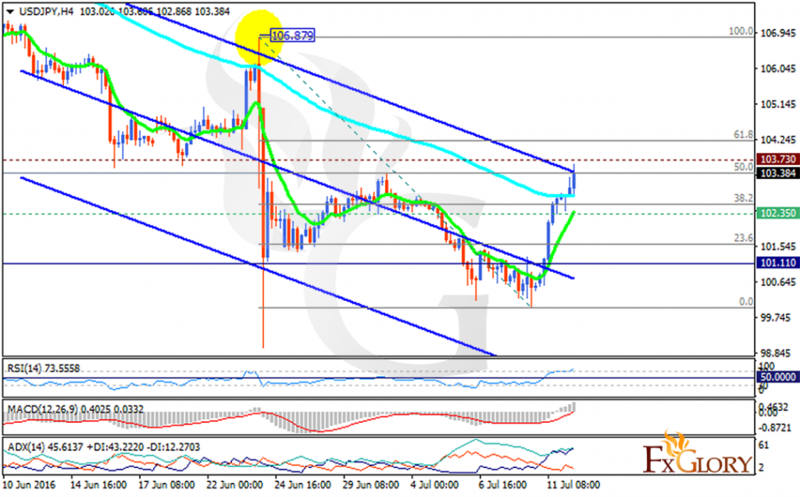 The resistance level breakout will push the price to higher levels targeting 104.50.